ATTACCO 0510-01 PER CARDINI A SALDARE IN FERRO OLMI. 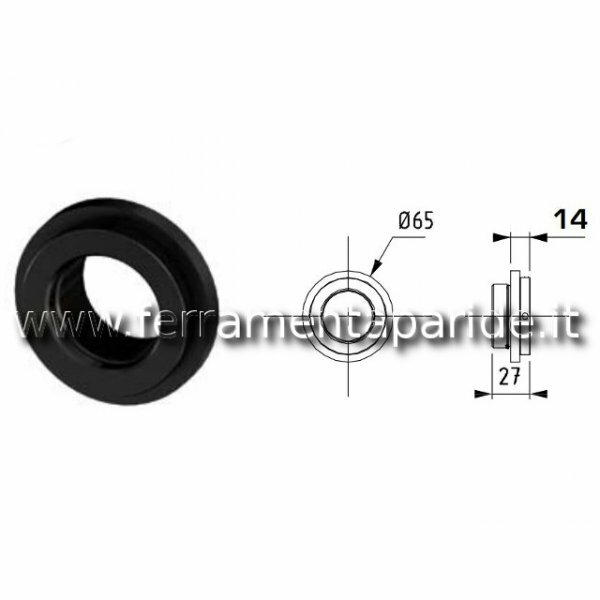 ATTACCO PER CARDINI OLMI MODELLO ARIETE SM W, 57SF W,108 W, 108 S, 108 SF W PER CANCELLI CON PASSAGGIO PEDONALE, FILETTO M37, D..
ATTACCO 6026-02 PER CARDINI AD AVVITARE IN ALLUMINIO OLMI. 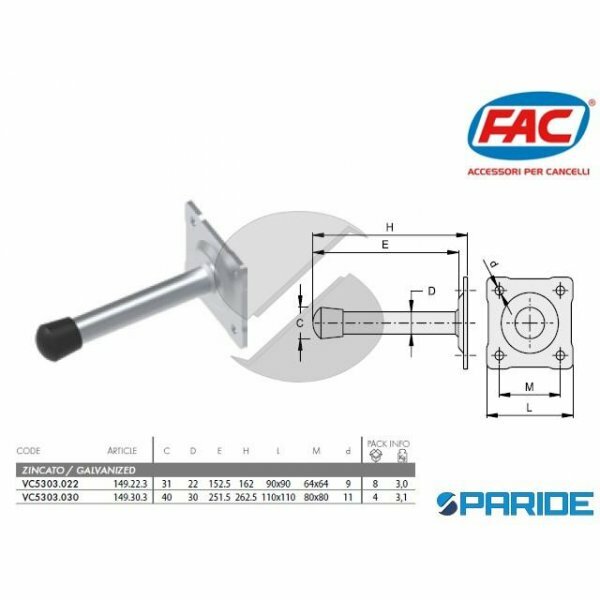 ATTACCO PER CARDINI OLMI MODELLO ARIETE SM S, 57 S, 57SF S, 108 S, 108 SF S PER CANCELLI CON PASSAGGIO PEDONALE, FILETTO ..
BATTENTE A PARETE 149223 CON PIASTRA A FISSARE FAC VC5303022. 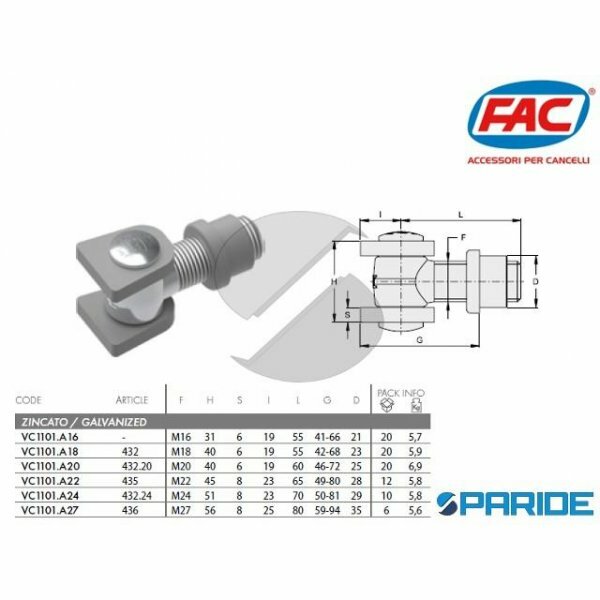 BATTENTE A PARETE ARTICOLO 149.22.3 CON PIASTRA IMBUTITA A 4 FORI A FISSARE, PER CANCELLI IN FERRO, DIAMETRO 22 MM, MI..
BATTENTE A PARETE 149T30 CON TASSELLO FAC VC5300030. 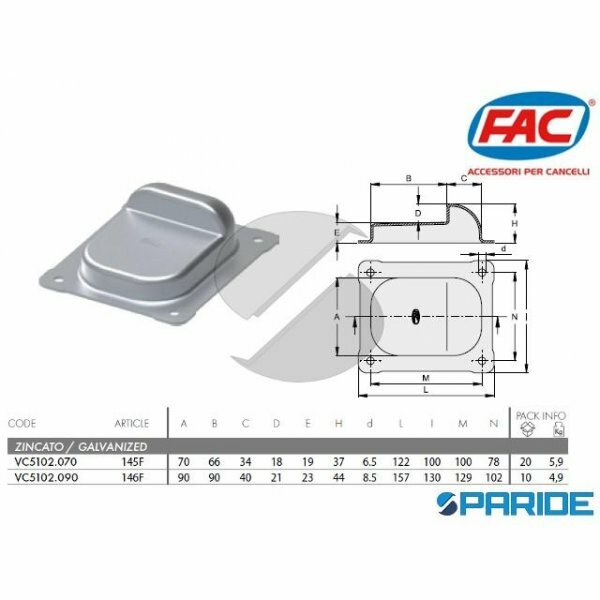 BATTENTE A PARETE 149T.30 CON TASSELLO, PER CANCELLI AD ANTE FAC VC5300.030, MISURE TAMPONE (C X E) 40X37,5 MM, LUNGHEZZA TASSE..
BATTENTE A TERRA 146F CON FLANGIA PER CANCELLO FAC VC5102090. 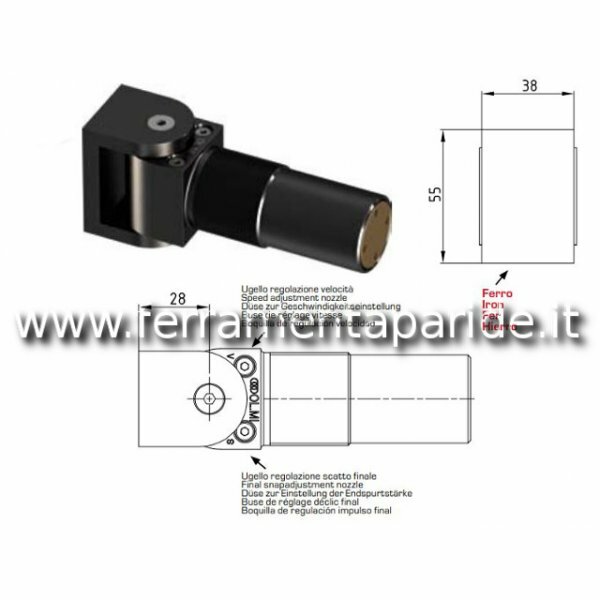 BATTENTE A TERRA 146F CON FLANGIA PER CANCELLO IN FERRO A 2 ANTE, A FISSARE, LUNGHEZZA 157 MM, LARGHEZZA 130, ALTEZZA ..
BATTENTE A TERRA 146P CON PIASTRA PER CANCELLO FAC VC510309. BATTENTE A TERRA, ARTICOLO 146 P, CON PIASTRA INTERNA PER CANCELLI A 2 ANTE A FISSARE, LUNGHEZZA BATTENTE 130 MM, ALTEZ..
BATTENTE BLR REGOLABILE PER ELETTRO SERRATURA ROLLING CENTER. 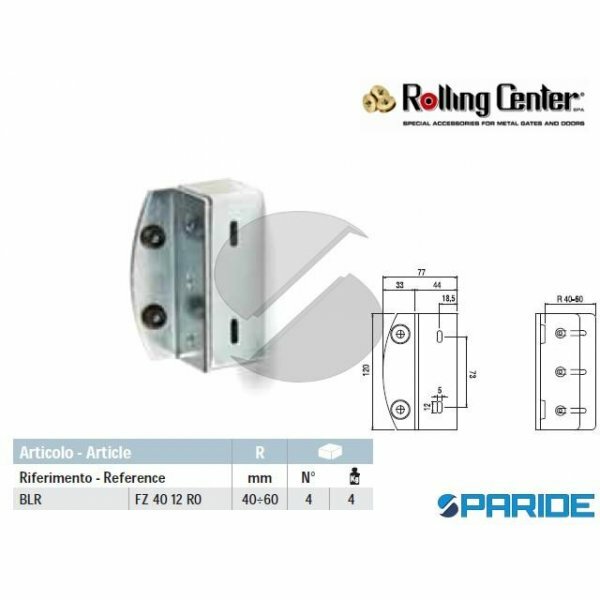 BATTENTE BLR ZINCATO REGOLABILE PORTA INCONTRO PER ELETTRO-SERRATURE ROLLING CENTER. 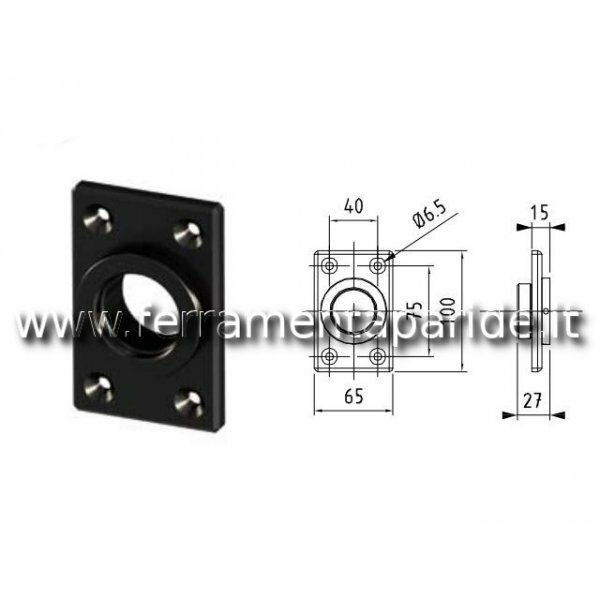 LUNGHEZZA BATTENTE 120 MM, REGOLA..
BATTENTE PER ELETTRO SERRATURE 150 FAC REGOLABILE VC5200050. BATTENTE PORTA-INCONTRO PER ELETTRO SERRATURE REGOLABILE, ARTICOLO 150 FAC, PER CANCELLI. LARGHEZZA REGOLABILE DA 45 A ..
CARDINE A CAVALLOTTO 131G REGOLABILE ROLLING CENTER. 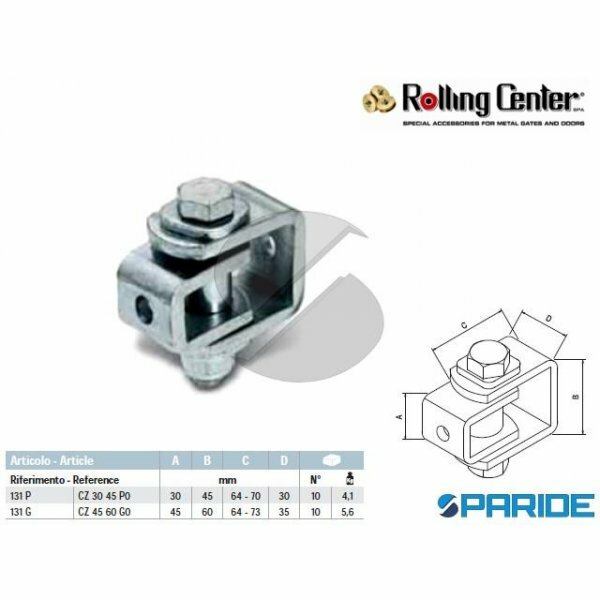 CARDINE 131G ROLLING CENTER PER CANCELLI IN FERRO REGOLABILE CON CORSA C DA 64 MM A 73 MM, DIMENSIONE A 45 MM, DIMENSIONE B 60 ..
CARDINE A CAVALLOTTO 131P REGOLABILE ROLLING CENTER. 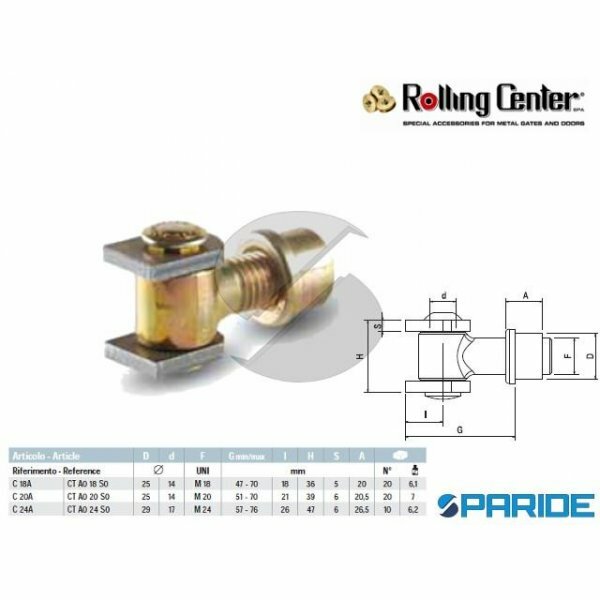 CARDINE 131P ROLLING CENTER PER CANCELLI IN FERRO REGOLABILE CON CORSA C DA 64 MM A 70 MM, DIMENSIONE A 30 MM, DIMENSIONE B 45 ..
CARDINE A FASCIA 890 122 REGISTRABILE CON BUSSOLA M18 NOVA-FERR. 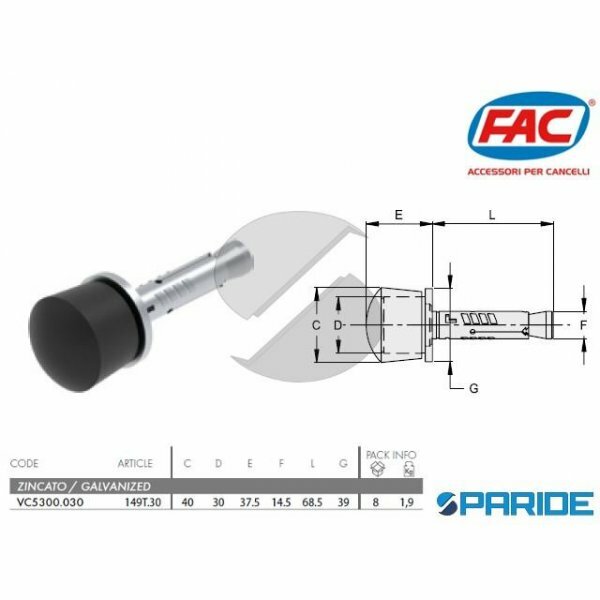 CARDINE A FASCIA, ARTICOLO 890/1.22 REGISTRABILE CON BUSSOLA M18, PER CANCELLI IN FERRO, LUNGHEZZA CARDINE 103 MM, ..
CARDINE A MURO A SALDARE REGOLABILE 431 FAC VC1102A18. CARDINE CON PERNO ANTIROTAZIONE A MURO A SALDARE REGOLABILE PER CANCELLI IN FERRO, ARTICOLO 431 FAC, LUNGHEZZA MASSIMA 130 MM..
CARDINE A SALDARE 43220 FAC VC1101A20. CARDINE A SALDARE 432.20 FAC, PER CANCELLI IN FERRO, LUNGHEZZA 75 MM, FILETTO M20, ALTEZZA 40 MM. CODICE CARDINE A SALDARE 432.20 FAC: VC1101..
CARDINE A SALDARE 43224 FAC VC1101A24. CARDINE A SALDARE, ARTICOLO 43224 FAC, PER CANCELLI IN FERRO, LUNGHEZZA 93 MM, ALTEZZA 51 MM, FILETTO M24. CODICE CARDINE A SALDARE 43224 FAC..
CARDINE A SALDARE 435 FAC VC1101A22. CARDINE A SALDARE, ARTICOLO 435, PER CANCELLI IN FERRO, LUNGHEZZA 88 MM, ALTEZZA 45 MM, FILETTO M22. CODICE CARDINE A SALDARE 435 FAC: VC1101.A..
CARDINE A SALDARE ARIETE 108 W REGOLABILE OLMI. 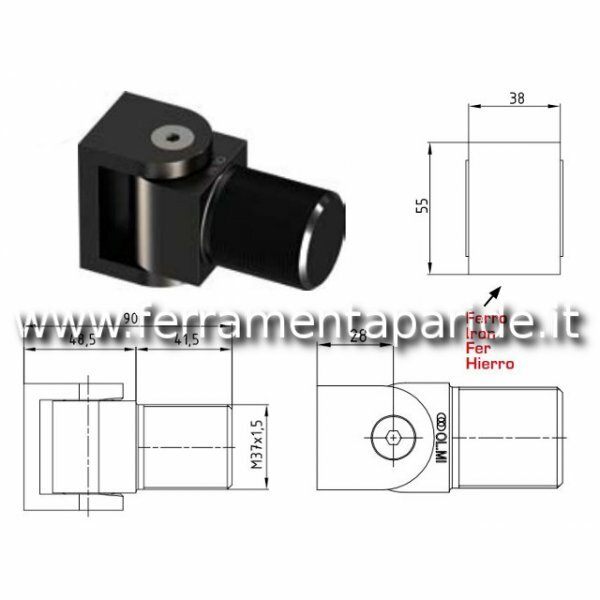 FILETTO M37X1,5 MM, LUNGHEZZA TOTALE 131,5 MM, ALTEZZA 55 MM, LARGHEZZA 38 MM, LUNGHEZZA FILETTO PIU PARTE LISCIA 83 MM. CARDINE PER..
CARDINE A SALDARE ARIETE SM W CON CUSCINETTI OLMI. FILETTO M37X1,5 MM, LUNGHEZZA TOTALE 90 MM, ALTEZZA 55 MM, LARGHEZZA 38 MM, LUNGHEZZA FILETTO 41,5 MM. 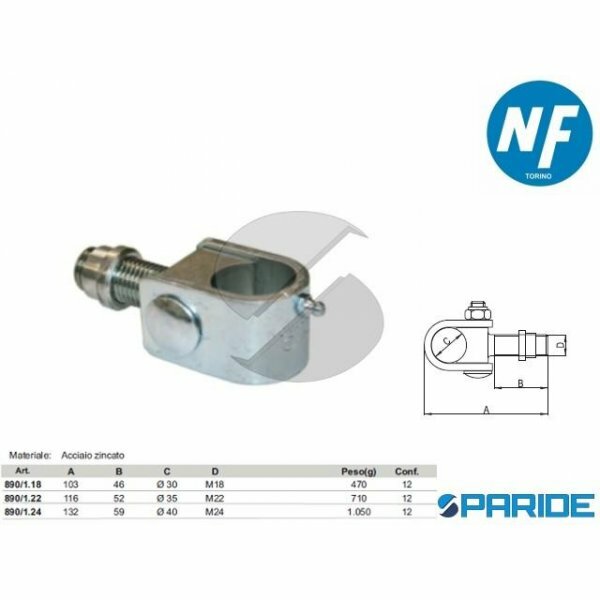 CARDINE PER LE APPLICAZION..
CARDINE A SALDARE C18 CON FILETTO M18 ROLLING CENTER. CARDINE PER CANCELLI IN FERRO A SALDARE CON CORSA G DA 47 A 70 MM. DIMENSIONE I 18 MM, DIMENSIONE H 36 MM, SPESSORE 5 MM, ALTE..
CARDINE A SALDARE C18A CON ALI ROLLING CENTER. 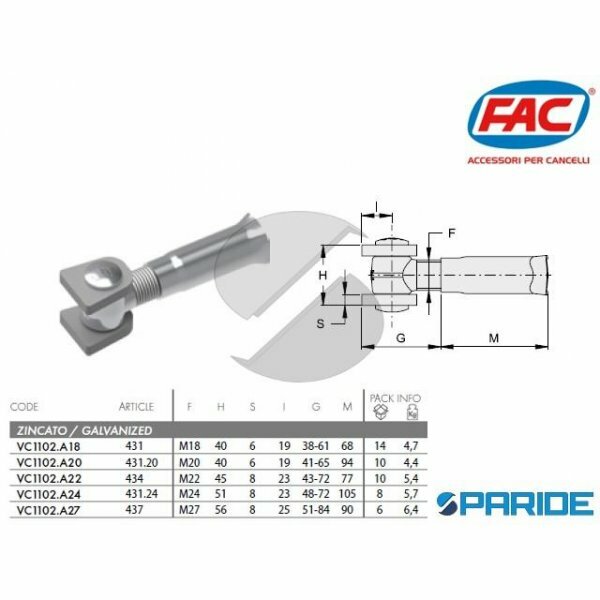 CARDINE PER CANCELLI IN FERRO A SALDARE CON CORSA G DA 47 MM A 70 MM, DIMENSIONE I 18 MM, DIMENSIONE H 36 MM, SPESSORE 5 MM, ALTEZZA ..
CARDINE A SALDARE C20 CON FILETTO M20 ROLLING CENTER. CARDINE PER CANCELLI IN FERRO A SALDARE CON CORSA G DA 51 A 70 MM. DIMENSIONE I 21 MM, DIMENSIONE H 39 MM, SPESSORE 6 MM, ALTE..
CARDINE A SALDARE C20A CON ALI ROLLING CENTER. 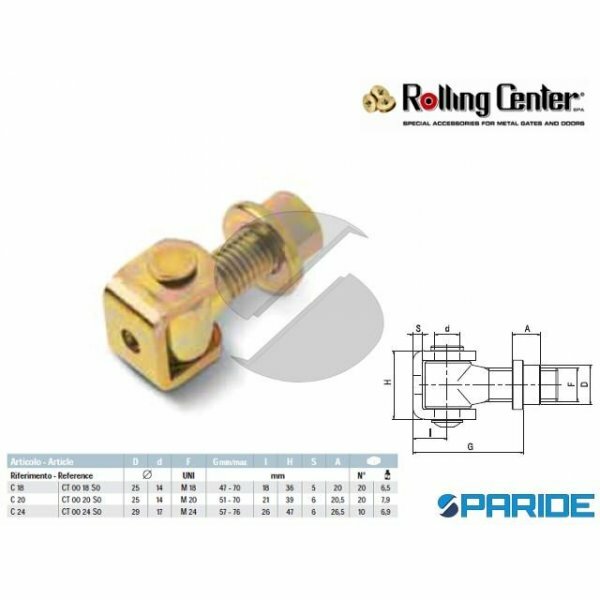 CARDINE PER CANCELLI IN FERRO A SALDARE CON CORSA G DA 51 MM A 70 MM, DIMENSIONE I 21 MM, DIMENSIONE H 39 MM, SPESSORE 6 MM, ALTEZZA ..
CARDINE A SALDARE C24 CON FILETTO M24 ROLLING CENTER. CARDINE PER CANCELLI IN FERRO A SALDARE CON CORSA G DA 57 A 76 MM. DIMENSIONE I 26 MM, DIMENSIONE H 47 MM, SPESSORE 6 MM, ALTE..
CARDINE A SALDARE C24A CON ALI ROLLING CENTER. CARDINE PER CANCELLI IN FERRO A SALDARE CON CORSA G DA 57 MM A 76 MM, DIMENSIONE I 26 MM, DIMENSIONE H 47 MM, SPESSORE 6 MM, ALTEZZA ..